Mr. Monoploy Can I Have Your Number? Can I? Even though I’m a resident in Toronto, I find that I never do any ‘touristy’ things. To change this behaviour and push myself to explore Toronto more, I’ve decided to challenge myself to venture out into the city to find ‘hidden gems’. My main goal is to exploit the beauty of this bustling city in landmarks or art in Toronto and incorporate some kind of fashion with each photo. First up is this hidden gem of Mr. Monopoly that I stumbled upon walking to a club in Toronto. I had to come back and take a picture with this handsome fellow! 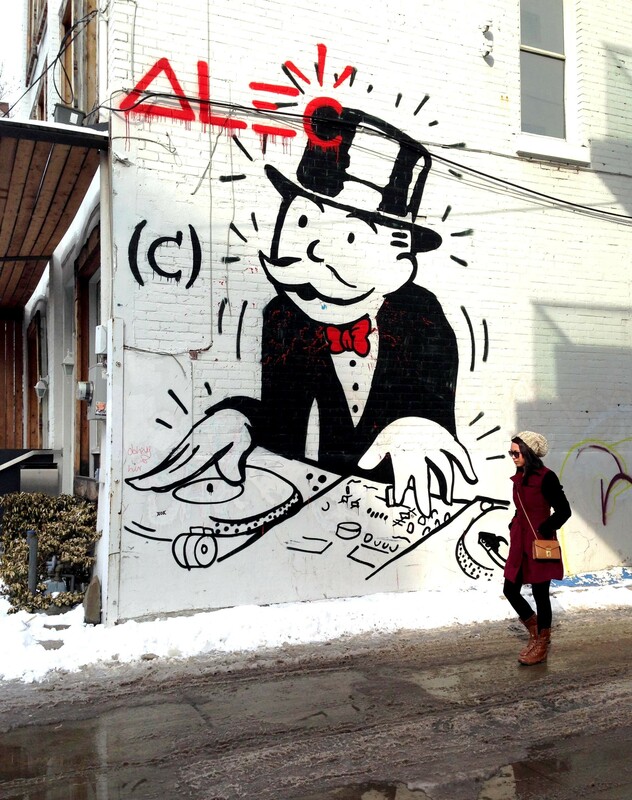 Posted in Fashion, Graffiti, Photography, WinterTagged contrast jacket, DJ, fashion, Graffiti, Mr. Monopoly, ootd, photographyBookmark the permalink. Cute! Love the mural and the outfit!